Those are the three words I would use to describe Cookie Bark. 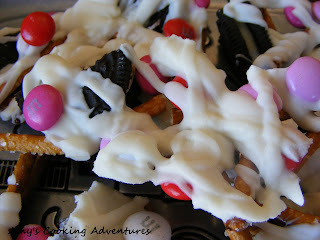 All you have to do is take out some of your latent anger on some Oreos and pretzel sticks, melt some candy, and voilà! You have an irresistible Valentine’s treat. This can be customized to basically any holiday, or made for everyday enjoyment. Now go, just try and keep your hands off of this! Line 2 cookie sheets with parchment paper. 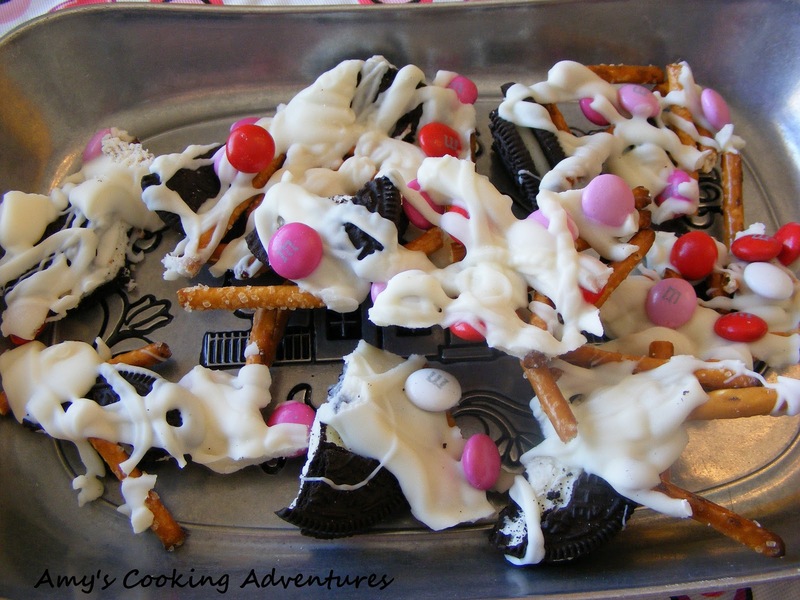 Spread half the broken cookies and half of the pretzel sticks onto each cookie sheet. Sprinkle ¾ cup M&M’s equally onto the cookies and pretzels. Place the almond bark in a microwave safe dish. Microwave for 90 seconds and stir. Continue microwaving for 20 second increments and stirring until the almond bark is completely melted and smooth. Using a spoon, drizzle the melted almond bark over the cookie and pretzel mix. While the candy is still wet, sprinkle the remaining ¼ cup of M&M’s over the two sheets. Allow to set for about 20 minutes, then gently break into pieces. Store in an airtight container. Oooh, I want to try this. What a pretty effect with the valentine m&m's! Looks yummy!